I’ve just signed a contract to translate a 1000-page novel. It is due to the publisher in May of 2017, so I’ll be working steadily on it for the next couple of years. The publisher (the visionary Archipelago Books) asked for a sample, but I had not read the book, which came out in 2013, so I asked if they had a print copy they could send me, and they agreed. I knew the author’s work already and had actually approached the same publisher about another of his books, Buick Riviera, which I like a lot, but they indicated that they wanted to publish several other works by him before they got to that particular book. 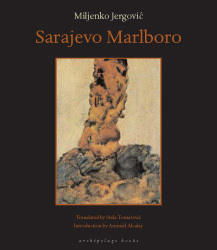 They had already at the time published his Sarajevo Marlborough, an exquisite collection of short stories about the war, translated by Stela Tomasevic. Then came this request. I read some reviews online and then read, when it arrived, through the book—I wish we could use the Russian imperfective verb for such expressions, as it suggests more “I engaged in reading” than “I read the whole thing” and that would be closer to how I read in this case—and decided I liked it and wanted to try my hand at it. I was very busy with a host of other things and had trouble squeezing out the 5,000 words from the beginning that I eventually sent them. I got a note back immediately from the publisher. Could I do the whole thing? A friend later said I should have talked to him before signing the contract because he “could have talked me down off that ledge” (he had done a similarly massive project and it had taken a lot out of him), but I didn’t have anyone to do that at the time, and the book seemed to be calling. It is Rod, by Miljenko Jergović, which I’m translating as Kin, for now at least, as maybe a different title will surface as I go. The source language is what we refer to these days as Bosnia-Croatian-Serbian, or BCS, and some people add Montenegrin to the mix lately, making it BCMS. The author is a Bosnian Croat from Sarajevo, the publisher, Fraktura, is based in Zagreb, but much of the usage is older and regionally specific. Jergović is very sensitive to such nuances and likes to pepper his prose with them, often with ironic intent. The title Kin seems good to me now, a very short title for a very long book. Kin, moreover, has many of the connotations that rod has, as well as many of the root associations. Rod is much richer, however. Rod is at the heart of roditi, to give birth or, when reflexive, be born. It is in the word for relative, relation, and cousin. Kin, in turn, is in kindred and kindergarten, and kind. It also has a very old feel, something almost primordial, and this is true of rod as well, a Slavic root that reaches to concepts such as parenthood, fertility, maternity, and motherland. I don’t know that English has a single word that can do that, so kin might have to do. One of the reasons I like the book and have agreed to work on it is that it dovetails with some of my own thinking about cultural mixture, crossing, hybridity, especially in families, including my own of course. So I suppose there is a “simpatico” element to my motivation. I often feel that I know what the author is referring to beneath the surface layer of the words of a sentence. These thoughts come to me in my sleep or the next morning as insights into the book or the language or life in general. I’ll be writing about this work from time to time, as it will be occupying my mind. These pages will allow me a forum for expressing things as they pass that otherwise would disappear in the invisible revision process from one “save” to the next on my screen. And I’ll be posting some excerpts, maybe passages I’m having difficulty with, or those I think are especially good. Here is a passage at the end of the book’s first section. “A year after the fall of the nationalist government, during the coalition led by the Social Democrats under Ivica Račan, whose Europism brought a sigh of relief to Europe, and to its Croatian neighbors first and foremost, I was at a film festival in Istria. It was held in an ancient walled city on the top of a hill that was once inhabited exclusively by Italians who, after Istria became part of Yugoslavia, were given the opportunity to vote by the Communists—either to go away as Italians or to stay behind as Yugoslavs—and these people had set off on their way, bags in hand, to spend years in Italian refugee camps, leaving their Istrian homes behind forever, and so this festival, in this town, was a form of socio-political, as well as cultural ceremonial marking a new, anti-nationalist Croatia. Of course the new minister of culture showed up, whose supporters and sympathizers had taken to calling the “Croatian Malraux,” an appellation he was prepared to accept, being that in Croatia, and as a rule in the former Yugoslavia, and in the Balkans as a whole, it is common and accepted practice to name leaders and dignitaries after magnificent foreigners, Franz Beckenbauer, Emperor Selassie, Shakespeare, in short, who cares. Anyway, this minister of ours, this Croatian Malraux, was previously a lexicographer, which means he was mostly taking it easy, or having intellectual debates at the pub after he had inspected the two or three lexical items that had turned up on his desk that day. I was not fond of the way he ran the Ministry and wrote an article about it in the newspaper, though I was truly gentle, far gentler than when I had written similar articles against Tudjman’s nationalists. “I wasn’t thinking of my article when that afternoon I approached a café table around which, in the shade of an immense Slavic tree sat a group of directors, producers, and general practice intellectuals, with Minister Malraux at the head. I knew these people, the Minister too, and I merely wanted to convey an every-day hello in passing. “‘Beat it, you Bosnian trash! Go back where you came from so we don’t have to send you ourselves!’ shouted Malraux. I didn’t get too upset, since the previous night was filled with such hard work and exertions that the ministerial hangover extended to the afternoon. But still I stopped long enough to look carefully at a director who had been blacklisted during the Tudjman years and whose films were not allowed to be shown on television then. He was a tough dissident, as tough as Kundera if not tougher. He looked down and did not say anything. He needed to be watchful of the ministerial hangover because he wanted to make movies again, and that, in Croatia, does not happen without government money. A promising young producer also looked down, a fighter against nationalism in every form and apologist for inter-ethnic affection, and everyone else, one after another, looked down, dissidents one and all from the time of Tudjman, until, after I had stood there for far too long waiting, I turned and made my way down that Istrian knoll, the Croatian Malraux shouting behind me.